Who looks after our area? The main responsibilities for looking after Horley and the surrounding area varies between Horley Town Council, Reigate & Banstead Borough Council and Surrey County Council. Our local town councillors work hard for Horley. They give their time and energy to make Horley a better place to live and work, and they don't get paid. Each Town Councillor has their own area. You can find your area on the Horley Town Council website. Contact your councillor they are always glad to help. The Horley Town Management Group (HTMG) meets once a month to discuss and develop initiatives and actions to promote the town of Horley as a safe, progressive and positive community through partnerships with local business, government and community groups. The purpose of the group is to set the broad vision for the Town, taking into account the needs of all the Town's customers, residents, visitors, traders and businesses. This includes improving the appearance, amenities and accessibility of Horley and to seek funding for the initiatives. A Business Plan and Action Plan are key priorities of the HTMG, and the meetings serve as a forum for the partners to enable them to look outwards and promote and market their Horley Town. Over the last two years consultations with local people, local shops and businesses have taken place. From these consultations a document (Horley Town Centre Vision) has been produced that outlines a range of proposed initiatives and improvements for Horley. This document has been well received and work is now underway on these projects to turn these ideas into action. Please contact the Chairman, Andy Lynch (Tel 07970 985577) if you wish to discuss any aspects of the Group. Alan Jones, Town Clerk is the Secretary. Contact details: 01293 784765. Reigate & Banstead Borough Council are responsible for a huge number of services, from parking, recycling, planning to rates, environment, council tax and much more. Search the Reigate & Banstead website. As an example, here is a link to their page about Horley car parks. Reigate & Banstead Borough Council also have a 'Report it' page, where you can report problems. Webcasts of Council Meetings. Reigate & Banstead now use webcasting to broadcast council meetings through the internet. full Council, Executive and Planning meetings are now filmed and broadcast live via their website, enabling you to watch debate as it happens, hear discussion from your local councillors and see decisions being made. Recordings are then stored on their website so that they can also be watched at a later date. Here is the link to their webcasting page. Consultation on the Reigate & Banstead Local Plan. You can comment as Reigate & Banstead develop their local plan. Here is a video guide to how to use their interactive map and consultation process. Click here to see a list of the Reigate & Banstead Borough Councillors for Horley. Sam Gyimah is one key person to contact. Sam holds a surgery in Horley once a month and also can be contacted via his website. Read more . . .
Surrey County Council also have a 'Report it' page. This link goes to their Report a pothole page. If you have had flooding problems, they have a lots of information about getting help. They even have a 'Flooding and Wetspots' page. Surrey Police, Reigate & Banstead area website. Helicopter over your house? You can follow the National Police Air Service on Twitter. Fascinating! Visit the NPAS Twitter page. The government website gives this advice on calling the police. 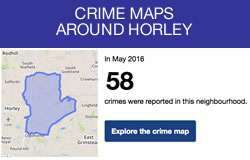 Surrey Police publish crime maps online. These maps can be a great help in encouraging communications between Surrey Police and our local community. The police value local information and intelligence. Click here to see one of the local police crime maps. Chief Constable for Surrey Police. Nick Ephgrave is the new Chief Constable for Surrey Police. The Office of the Police and Crime Commissioner for Surrey has a number of initiatives that can be seen on their website. They encourage you to get in touch with any concerns you have. Visit The Office of the Police and Crime Commissioner for Surrey website. Horley Online is run by a small team of local people. It has no political affiliations and is not run by the local council. Our local advertisers keep Horley Online, online, so please support our local businesses. Recycle your old furniture at Furnistore. As a registered charity, the main aim of Furnistore is to provide people on 'low incomes' with good usable furniture. In doing this they also help the environment by preventing unwanted furniture from going to landfill (a major problem in the South-East of England). Visit the Furnistore website.